Choose a durable and beautiful material for your busy household when you shop at our local flooring showroom. With our collection of waterproof flooring in Ankeny, IA, you will find the perfect option to upgrade the look of your space without the need for regular maintenance and upkeep. Shop at our store today to discover your options in waterproof luxury vinyl flooring and carpeting for every room. Are you ready for a change in your home? When it is time to upgrade the look of your space, it is important to choose the right material. 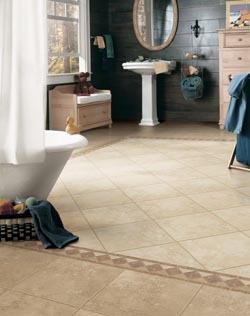 Bathrooms, basements, and other moisture-prone areas require a sturdy flooring material. By choosing waterproof vinyl flooring for your rooms, you will avoid stains, warps, and other common issues caused by moisture. How does waterproof flooring work? This durable material is made with a unique construction that makes it able to prevent liquids from soaking into the vinyl or carpet padding and the subfloor. Whether you often deal with the cleanup of pet stains, spilled juices, or other messes, waterproof flooring is the right option for you. Avoid the need for repairs and maintenance when you shop with our team for your waterproof flooring. Our collection of carpet, plank, and vinyl includes options that are ideal for spaces of any size. No matter what part of your space you are ready to remodel, you are sure to find something you love when you turn to us. Our inventory includes options from some of the top brands in the industry, including Downs H20 and Tigressa H20. Whether you have kids or pets, your floors go through a heavy amount of use each day from either of these sources. When you choose the waterproof carpet and vinyl varieties from our showroom, you will install the perfect set of flooring for your home. Our in-stock varieties include products that fit every taste preference. Add a plush feeling to your home when you choose to install a new set of carpeting. By choosing our waterproof carpet for your space, you will never have to deal with issues caused by heavy foot traffic or spills. No matter what you drop on the floor, you will be able to clean the area with ease. Contact us in Ankeny, Iowa, to shop our selection of waterproof flooring for your space. Our showroom features waterproof luxury vinyl flooring for customers throughout the area.